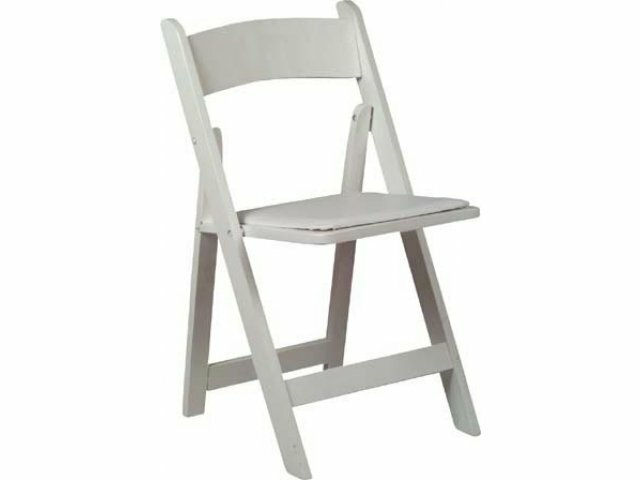 If you are planning a wedding or any other special event that calls for elegant yet inexpensive extra seating, wooden folding chairs are a great way to go. These folding chairs have a vinyl upholstered seat that is designed for easy cleaning. The white paint finish is designed to withstand harmful UL light from bright sunshine without fading or chipping. The secure seat locks into place to prevent collapsing. The wedding chair's vinyl upholstered seat cleans up easy with surface cleaner and non-abrasive cloth. All components are zinc plated to ensure longer life. Weight capacity for these seats is 300 pounds. These wooden folding chairs are perfect when you need to seat lots of extra guests but don't want to spend a fortune. Outdoor Protection: 100% UV-stabilized paint finish provides beautiful coloration and material protection. Durable: Components are zinc-plated to help prevent rust. Strong: A steel reinforcement crossbar makes these chairs extra-sturdy. Secure Sitting: Seat locks into place to prevent collapsing. Elegant Appearance: Matching white chair frames and seat cushions are perfect for formal occasions. Easy Cleaning: Vinyl upholstered seats clean up easily with surface cleaner and non-abrasive cloth. Portable: These wooden folding chairs can be quickly collapsed and stacked. Stackable: Stack up to 26 chairs high when collapsed for easy transport and storage. Convenient: Individual storage bags are included at no additional charge.